Chiefs Fortune Classic Slot Guide & Review - Casino Answers! 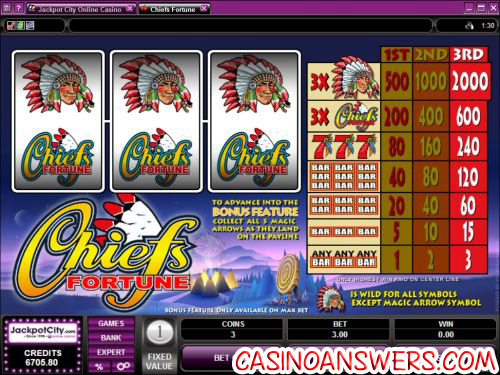 Chiefs Fortune is a 3-reel, 1-line slot machine developed by Microgaming. It features wild substitutes and a bonus game. You can play Chiefs Fortune at Wild Jack Casino and Gaming Club Casino. Payouts on the Chiefs Fortune bonus slot are (1/2/3 coin payouts in parenthesis): 3 of any bar symbols (1/2/3), 3 single bar symbols (5/10/15), 3 double bar symbols (20/40/60), 3 triple bar symbols (40/80/120), 3 7 symbols (80/160/240), 3 Chiefs Fortune logo symbols (200/400/600), 3 Chief’s head symbols (500/1000/2000). Only the highest win on the center payline will be paid out. The top jackpot on Chiefs Fortune is the Chief’s Head symbol. On a 3-coin bet, 3 Chief’s Head symbols will win you 2000 coins. The Chief’s Head symbol is also the wild symbol. It will substitute for all symbols in the game except for the bonus magic arrow symbol. Switch Chiefs Fortune into expert mode and you will enable autoplay. Autoplay settings are: number of spins, number of seconds between spins, to stop once all spins are complete, stop when jackpot is won, stop if a win exceeds or equals (your selected amount), stop on any win, stop on bonus feature, stop if credits increase by (your selected amount) and stop if credits decrease by (your selected amount). You may stop autoplay at any time. If you’re looking for a place to play the Chiefs Fortune bonus slot machine, you can get a 100% up to $100 bonus plus 10% monthly cashback at Wild Jack Casino! Are US players able to play the Chiefs Fortune bonus slot? Microgaming casinos are not accepting US players at this time. Americans can find some other great reel slots at Lucky Red Casino along with a 400% up to $4000 signup bonus. Is there an instant play version of Chiefs Fortune available? Wild Jack Casino has a no-download Flash casino as well as their downloadable software. If you have any problems playing the Chiefs Fortune Flash game in your browser, make sure you have the latest version of Adobe Flash Player installed on your computer. What special features does Chiefs Fortune have? 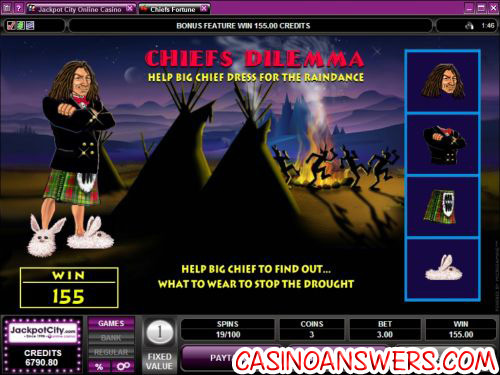 Chiefs Fortune has a bonus game where you can dress the chief up for a Raindance to win a bonus prize. There is also a wild symbol on the slot machine. Is there any cowboys and indians slot machine games? What casinos have the Chiefs Fortune slot machine game? Where can I play Chiefs Fortune?